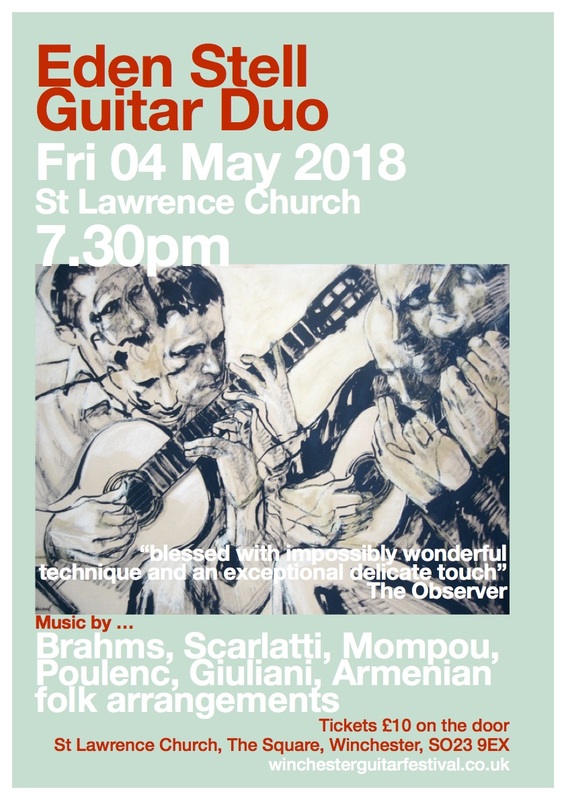 The Eden Stell Guitar Duo will be giving a fundraising concert for the festival in St Lawrence Church on Friday the 4 May at 7.30PM. The church is a favourite with the festival over the years with its wonderful acoustics for the guitar, and it’s intimate historic setting in the heart of the City. The Duo’s program will include three new Domenico Scarlatti sonata arrangements, Francis Poulenc’s Suite originally for piano, Johannes Brahms’ Variations from the Sextet in Bb Major arranged by John Williams, Mauro Giuliani’s Grand Variation Concertante, Armenian folk song arrangements, and a two sets of Federico Mompou’s Cançons i Dansas which feature on the Duo’s newly released CD of the complete Song and Dances. Tickets are £10 on the door.